Let’s see, did we forget anyone? If they like their driving mixed with a little excitement, there’s the full-sized Chevrolet … Chevy II gives them the same smart spirit in a smaller package…Corvair’s just right for the small car crowd. Pontiac? A glamorous new Wide-Track and this sleek new Pontiac Tempest will do it. 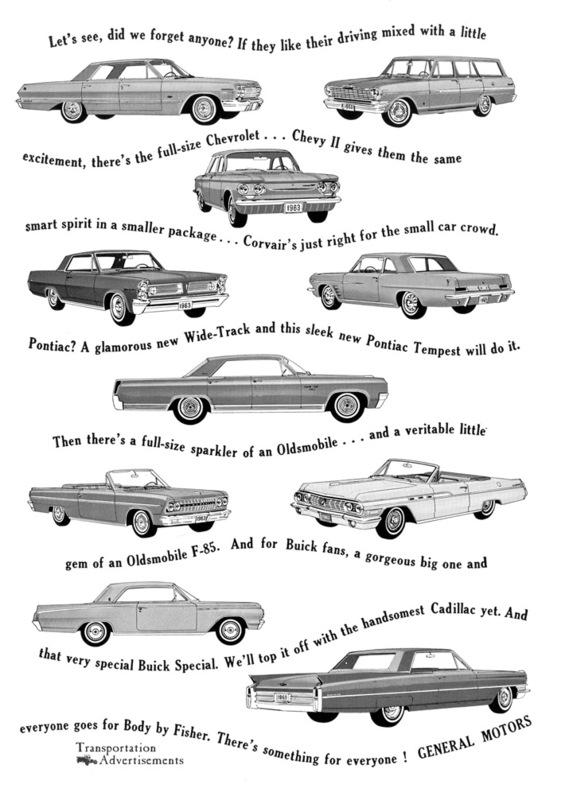 Then there’s a full-sized sparkler of an Oldsmobile…and a veritable little gen of an Oldsmobile F-85. And for Buick fans, a gorgeous big one and that very special Buick Special. We’ll top it off with the handsomest Cadillac yet. And everybody goes for Body by Fisher. There’s something for everyone! General Motors. Welcome Home. All is Forgiven. In the past three or four years, Americans have bought 5,559,397 “compact-compacts.” Some were foreign cars. Many were U.S. Names. Research can give you a long list of reasons why people bought these little cars: economy, convenience, fun, “be the first on the block,” etc. But judging from what our dealers tell us, it’s clear right now that thousands have had their fling with the “compact-compact”… and are ready to come back to a motor car with room, comfort, quality, lasting value, and dealer-service facilities to match. In short, all the tings that have made American motor cars the envy of the world. This judgment is based on the fact that one of our cars… the happy medium-size Buick Special… is the subject of the most sensational automobile success story in years. Special provides the disillusioned “compact-compact” owner the ideal place to come home to. 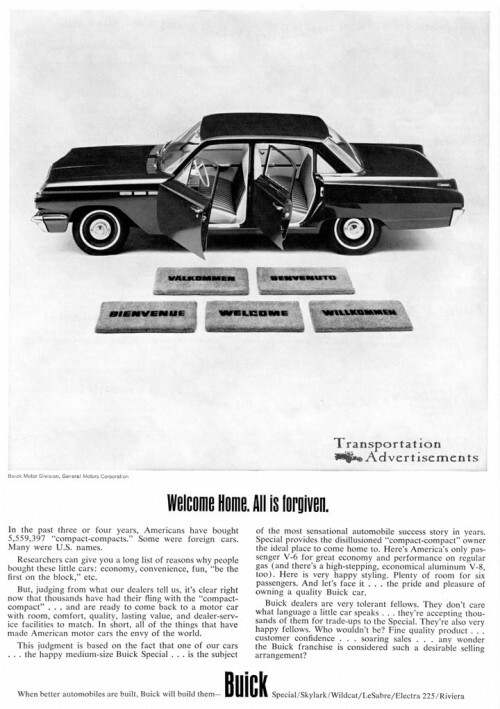 Here’s America’s only passenger V-6 for great economy and performance on regular gas (and there’s a high-stepping, economy aluminum V-8. too). Here is a very happy styling. Plenty of room for six passengers. And let’s face it… the pride and pleasure of owning a quality Buick car. Buick dealers are very tolerant fellows. they don’t care what language a little care speaks… they’re accepting thousands of them for trade-ups to the Special. They’re also very happy fellows. Who wouldn’t be? Fine quality product… customer confidence… soaring sales… any wonder the Buick franchise is considered such a desirable selling arrangement? Transportation Advertisements is powered by	WordPress 5.0.4 and delivered to you in 0.574 seconds using 34 queries.